You want your home to have the quality known as curb appeal. Does your house have it? Look at your house as if you’re seeing it for the first time, and view it objectively. What is there now, and what can you do to improve the home’s overall presentation? Curb appeal takes a holistic approach. No one thing defines it, but people know it when they see it. Curb appeal means a home that appears fresh and clean. If your house and its trim need painting, spend the money and have it done, or consider having siding put on the house. You can power wash your driveway and walkways to eliminate accumulated grunge. Remove any in your yard or on your porch. Wash your windows until they shine – the reflect the soul of your home. Repair or replace anything detracting from your home’s appearance, whether it is cracked pavement, split siding, saggy gutters, or broken fencing. Proper landscaping is one of the best investments you can make to enhance your home’s curb appeal. 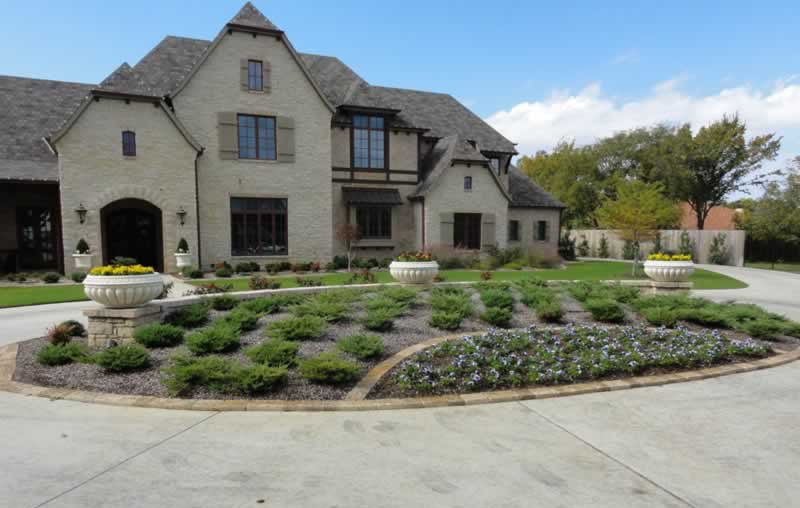 Professional landscaping works to accentuate the property’s assets and downplay any liabilities. If your home’s landscaping is mature, make sure it is adequately maintained. Cut back any overgrowth and remove anything growing out-of-control. Add fresh mulch and a border to separate the garden from the lawn. Your lawn should always appear green and immaculate, trimmed, and carefully edged. If your lawn requires work, contact a professional for advice ahead of time so your grass flourishes. The condition of the roof often reflects the home’s overall state, so the roof’s appearance is crucial. Get the roof in order by replacing any damaged or missing shingles. Have the roof professionally cleaned so that it looks as good as the rest of the house. An ordinary mailbox doesn’t reflect well on your house. Consider installing an upscale mailbox, or improve the look of your current one by giving it a coat of paint and planting flowers around it. Add brass or architectural address numbers to the mailbox or house for a nice touch. There’s no reason your driveway should look boring. If it needs some work, consider adding a border for a more sophisticated look. Belgian block looks great but is expensive. Cement pavers along the driveway’s edge are a cheaper but still attractive alternative. Good landscape lighting not only makes the house look welcoming at night but offers protection for your family and visitors. For exterior lights needing an update, replace them with fixtures and bulbs that bring out your home’s best features. Make sure the driveway, entranceway, and walkway are all well-lit for safety purposes. Superior curb appeal means your house welcomes visitors. Give the front door and shutters a fresh coat of paint and replace the hardware. Put some blooms in pots and add a new, attractive welcome mat. Curb appeal means you can’t wait to come home to your piece of heaven.